In MicroStation CONNECT the Element Information dialog has been renamed to Properties. The dialog functions the same way as in previous releases; however there are additional pieces of information displayed. In the image below we are reviewing the properties of a selected Shape element. This particular shape is patterned and has other elements associated with it. 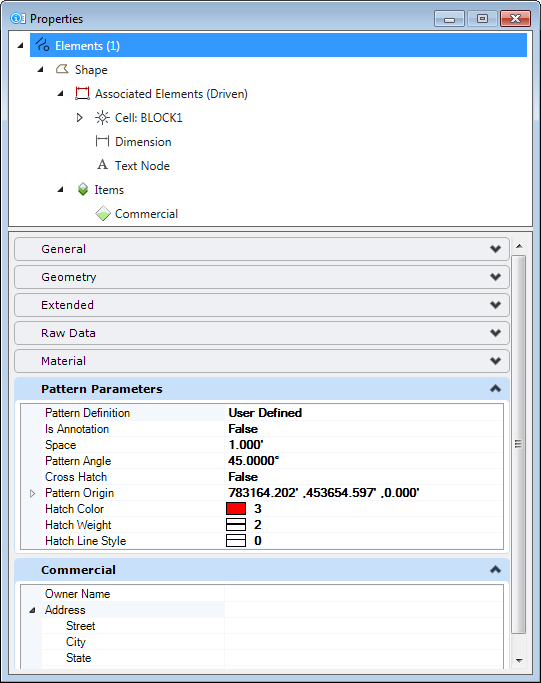 The pattern parameters of associated patterns can now be edited in the Properties dialog by opening the Pattern Parameters pane. The other associated elements can be displayed as sub entities. This particular shape element has a Cell, Dimension Element, and Text Node Element associated with it. Selecting any of those elements will display the properties for that element. The Items category associated with this particular shape are the replacement for Tag elements. The item values (formerly Tag Data) can be modified in the Properties dialog as well.